Wisdom tooth extractions can be a difficult procedure, especially if the tooth is impacted in the gums. It takes a trained professional to be able to extract the tooth correctly and ensure that there will be no following problems. The team at Access Dental Care is ready to help you when it comes time to remove your wisdom teeth. One of the most important things that you should know is that all wisdom teeth do not have to be removed. In fact, many patients are able to keep some of their wisdom teeth. The determination to remove a wisdom tooth is determined by the problems it may present which include pain and overcrowding in your mouth. If you are concerned about a wisdom tooth that is growing in your mouth, please call our office today to schedule an appointment with one of our dentists. An impacted wisdom tooth is one that has not fully grown in and the tooth may be sticking out slightly or it may be growing in at an angle or unevenly. When this happens, it can be difficult to keep the tooth clean, which means that tooth decay is likely to form and cause more problems with the tooth itself. Since impacted wisdom teeth are at a higher risk for infection, decay, and pain, they need to be removed from your mouth in a timely manner. Patients may need to have one or all four teeth removed. 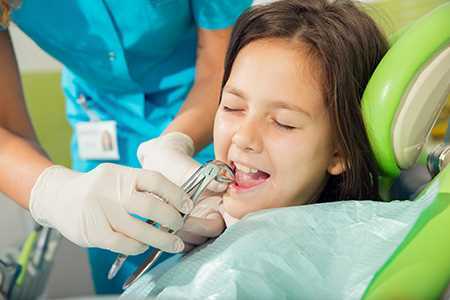 A wisdom tooth extraction procedure is fairly simply as long as there are no underlying conditions that may affect the tooth or the surrounding teeth and gums. Once you have had a consultation performed, you and your dentist will discuss the best way to approach the procedure. Most patients will receive a local anesthetic to alleviate pain and discomfort during the procedure, but some patients may need to have general anesthesia provided, so that they are asleep during the procedure. When the procedure starts, your dentist will make an incision on the gums to expose the wisdom tooth that needs to be extracted. Once the tooth is visible, it will be gripped with a special removal tool and your dentist will wiggle it around to loosen it. If the tooth is unable to be loosened with this tool, the tooth will be broken into several pieces to help facilitate extraction. After the tooth is removed, the incision will be stitched back together with sutures that will eventually dissolve in your mouth over time. Once the extraction has been performed, you will need to rest and also monitor how much blood you lose. The site of extraction will bleed for a bit, but should not bleed for more than 24 hours AFTER the procedure. You can apply an ice pack to the outside area of your cheek to alleviate swelling and pain. You should take all medication as directed and follow all after care instructions given to you by your dentist. If you believe you need to have a wisdom tooth extracted, please call Access Dental Care today to schedule an appointment.